We all have our heroes. Whether it is a parent, a brother or sister, a friend, a coach or someone like Nelson Mandela or Mother Theresa, we all have someone we look up to. Several people at times because as we grow, our heroes can change with us. As a little child you can look up to your father but as grown up it can be someone entirely different! Whoever it is, it is someone we want to be like. We see someone and think, if only I could be more like him/her. God has created everything in a unique way. When He created you, He did compare you to all the other humans that He had already created. On the contrary, He looked at you with new eyes. You are a unique masterpiece. And God didn’t stop creating, until you were absolutely perfect! And when He was done, He looked at you and saw that you were good…and He blessed you! A couple of blogs ago I shared with you the poem ‘The Sunflower’. This poem is a message that God gave me at a time when I was wondering why the grass seemed a whole lot greener on all the other lawns. I was downcast. God had promised me things that hadn’t happen yet. In my eyes, others seemed to get blessing after blessing, while my life seemed like one big curse. Not only was I frustrated with myself, I was also a bit disappointed with God. Why wasn’t I prettier? Why wasn’t I a better writer? Why did nobody seemed to notice me? Why was my life so hard? Every day I fired a million questions to God’s throne because I was disappointed with myself and my life. At that time I started painting. First God gave me a vision of a sunflower to let me know what my first painting had to become. After I painted ‘The Sunflower’, He gave me the poem. And the last sentence has nestled itself in my heart ever since. Where it is stored for times I need it. and all I ask is for you to see it too. God has the same message for you today! Look at a sunflower. Look at how it always grows towards the light of the sun, with it’s radiant yellow petals. That beautiful flower is you! You are beautiful and uniquely made. You may grow towards the light of God, knowing that you are so loved, every single day of your life. Don’t compare yourself to other people. Whether it are people at work, school, church or TV, magazines and the internet. Focus on yourself. Who do you want to be? Rest in God’s love and light. God sees you as His perfectly beautiful child! But more important is, how do you see yourself? Choose to see yourself through God’s eyes and focus on that only. You are a wonderful person just as you are! You are beautiful and uniquely made, a masterpiece created by the Almighty God Himself! And God loves you so much that He was willing to give up His beloved Son, Jesus Christ, so He could have a personal relationship with you! That is how much you are worth! That is who you are! You are God’s beloved child! Don’t you ever forget that! One morning, a couple of years ago, as I was sitting in the silence of the morning, I felt a deep desire to get my notebook and write. I felt the Spirit of God dance inside my heart as I wrote the following poem. until we learn how to walk in truth. where we can lean on in times of trial. The truth is the Light that sets our mind free. Eternal freedom that sets us in the Light. The last few days I was reminded by this poem. As if a voice whispered the title into my heart and soul. If we learn to walk in the truth, we will find the freedom that we long for. But what if the truth is not what we wanted to hear? Are we still willing to walk the path of the truth, if the truth is not what we expected? I think that is a question that will ultimately answer itself. An answer that will lead us to the door of our heart, that will show us, what is really inside. The Poem ‘A lost generation’ is based on two stories from the time I was working as a nurse in retirement homes. I had to stop working as a nurse, when I was in my early twenties, due to fybromyalgia. But these two stories never left my mind and heart. The first story is about a memory that a patient once shared with me. Due to confidentiality I cannot share names or places but I will tell you what happened. It was a rare moment that I entered her apartment. Usually my colleagues helped her but this one afternoon it was my turn. She was watching TV and usually didn’t speak much. But suddenly she started talking to me and I felt very privileged that she shared this particular story with me. She told me about when she was just a little girl. She had a bike and her parents only allowed her on the driveway of their home. “But”, she said, with sparkles in her old eyes, “Whenever father came home, I was allowed to drive to him, straight into his arms. He was a good man, my father”. She repeated this about three times and then went back to her usual silence while watching TV. I had tears in my eyes. She probably lost her father a long time ago but her love for him had only grown. It really touched my heart. The second story is a sad one. One afternoon I entered a woman’s room. She was sad. I asked her why and she told me that she missed her family. I suggested to her that maybe she could phone her children. Maybe they could come over? She looked at me and said, “Oh dear, that is so sweet of you to say but my children have their own life now, and I am not a part of that anymore” She continued saying that she understood. That they lived in the city now and had houses and family to take care of. She just didn’t fit in their life. She also said, “I worked hard to give him a good education. I worked day and night to give him everything I never got. He is living his life now”. Hearing her say that, my heart broke. This woman was stuck to an oxygen machine and could only leave her room for afternoon lunch. Otherwise she was always contained to her room. Her family hardly ever paid a visit. About three weeks after this conversation with her, she passed away. I was sitting at the reception desk when her son came from her room and was about to leave. I overheard him say to his wife, “Out of all the days she had to die, did she really have to chose this one? She knew have a meeting today and I am going to be late”. He was so angry that his work was interrupted by the death of his mother. He continued by saying that he hoped it would only last 20 minutes because he really had to go. My colleagues and I looked on in complete astonishment. Apparently his work was more important than his mother. These two moments happened over ten years ago and both women have passed away. But the stories have always remained in my heart. Sometimes I feel like the elderly are a forgotten generation. They have beaten themselves up for their children, but now they are being pushed away by the business of life. In my work as a nurse I had many people with fantastic children to take care of them like the woman in the first story. But there were also cases like the second story, where children brought their parents to a retirement home, so they didn’t have to look after their parents anymore. Such sad stories that you can’t fix as a nurse. The only thing I could ever do is listen to these people. However the love these people gave back, was a great reward and I miss being a nurse sometimes. I mean, writing is my life but so was caring for people. Both jobs gave me a sense of meaning and purpose. I was doing something good, something that helped people in whatever way they needed. About two years ago I decided to write a poem about these two memories from my time as a nurse. It is a dedication to a generation that I never forgot. And that I know God doesn’t forget either. A poem for all the lovely people I was blessed to meet. A thank you to their trust in me as a nurse. And a thank you to God for giving me the chance to help these people, even if it was only for a limited time. a cup with wrung-out tears. I wish the walls had ears. Your heart is focused solemnly on love. For this fast-paced life is too quick. and your memory loses the battle. I wish the world would slow down. I wish the blind eyes could see you. The poem ‘A shield of faith’ was the very first poem that I wrote after my seven year break (read the ‘About me’ section of my page!). It is based on Ephesians 6:10-20. Writing this first poem after such a long time, felt like someone breathed fresh air into my lungs. As if someone gave me back my life! Poetry is my thing. It makes me happy. It inspires me. And it is a way for me and God (the Father, Jesus & The Holy Spirit) to communicate. Poetry ended up becoming so much more than I ever thought it would be. It truly was God’s gift for me. I hope this poem will inspire you too! The other day I was visiting a friend of mine to meet her newborn baby. It is her fourth child and the sweetest little thing, as most babies are! I showed her my blog and she asked me a question. “Do you do all of the things you write about yourself”? “Yes I do”, I told her, “but I am still a work in progress though”. It is good to have a friend like her! A friend that is honest with you and not afraid to ask the right questions. I try to do everything I write about, however I am only human. Sometimes I am better at it, then other times. Especially when my fear is getting in the way. When I was in my early twenties, I was diagnosed, by a psychologist, with a general anxiety disorder. After I had therapy, it died down until a year and a half ago. I had a traumatizing experience at the dentist and ever since it is back in full force. Again I am fighting a high dosis of fear every day. A fear that was almost gone. I know, with the help of God, that I can overcome this fear but it takes a lot of patience. And patience is one of my weak spots. Often I want to rush things when I should actually take it easy. I want things to happen right away, when God asks me to wait. Fear will always be a part of my life…unfortunately. However often I have prayed for healing, it is something that I have come to terms with. After all, Jesus was afraid too when He was praying in Gethsemane garden! Right before Jesus was taken captive, He prayed to His Father if the cup could be taken from Him. Or in modern day language, if He could please be spared from what was awaiting Him. You know, many people say that Jesus was not afraid anymore after that. That after that prayer, He knew what to do and He did it without fear because He knew His journey. But you know what, I believe that He was still afraid. I don’t think the fear left Him. I believe that He simply decided to go through with it, regardless of His fear. And with the fear in His hands, He climbed on that cross. His love was bigger than His fear. His love being bigger than His fear is something that I recognize. When I like what I have to do, it is easier than when I have to do something I don’t like. When your heart is passionate for something, fear reduces to a tiny flame, making it easier to do it. But the tiny flame becomes a huge fire when your heart is not fully in on it. Of course there is a difference between a healthy fear, like before a speaking engagement, or a fear that goes through the roof. Sometimes I can control my fear but there are also moments that I cannot. For example, after the traumatizing experience at the dentist, I tried to ignore my fear for a long time. I went to the dentist again and even though I had a much better experience, the fear was so big that I could not control it anymore. The trick that God the Father, Jesus and the Holy Spirit taught me is; with patience and relaxation you can overcome it. The fear never goes away overnight. This is a fact that I have to be fully aware of, but it will go away in the end. This thought gives me a lot of peace already. The second step I take is becoming rational. I tell myself to calm down. Jesus loves me and there is nothing on earth more important than that. I also skip things from my agenda when I feel in my heart that I need time for myself. To plan moments of calmth is very important. I am not superwoman. I cannot do everything and that is okay. My life is not easy and God is keeping a lot of things away from me, like a family. Just because I am not married and I don’t have children, does not mean that my life is easier. I have not been requested to do it all, but to do what I can. I focus on my talents and gifts and not on what I am not good at. But the biggest of all remains patience! With a lot of patience, and a lot of faith I overcome my fear. I cannot let it go away but I can make it smaller and that gives me room to breath. Life remains a battle. Yet in this battle it is good to remind ourselves of one very important thing. Jesus love for us is everything! It is more important than our fear. And with that in mind we can overcome anything. Jesus’s love makes me get up every morning. Just the thought that, besides Jesus, I have a Father in Heaven who loves me so much, makes me want to try again. Of course I am not capable of doing everything. Like I said, I am not superwoman. There are some things that I am, and never will be, good at. But that is okay. God accepts me for who I am. And if I do the same; if I work hard and focus on the gifts and talents that the Father, in all His goodness, gave me, it will all work itself out in the end. Fear may be an ever present companion but at least I can shut him up whenever he talks to much! Optimism is the key to a happy life! Optimism is the key to a happy life. It really is. I believe that happy people are optimistic people. Optimism does not mean that you avoid problems in your life or simply turning a blind eye. Optimism, to me, means that you remain positive about the outcome regardless of the circumstances. When facing a problem, you don’t dwell in the problem but you look beyond the problem to the outcome and you make it a happy one. When I was a child, I was a very optimistic little girl. One of the things I always said was, “Everything will be okay. Maybe not today but in the end it will be”. And I believed in it. Why? Because I believed that God could literally do everything. Nothing was too out of reach for God. But when I grew up, I had moments when I doubted that. I did not doubt that God could do everything, but I did doubt that everything would be okay in the end. The problem, in my own point of view, is adulthood. There comes a time where we lose our childlike innocence. It is like someone takes our rose-colored glasses off and exchanges them for reality glasses. As we grow older we start to look at the world and lose a piece of our childlike positivity. A positivity that is so important for us. When I was nineteen years old (about two months before my twentieth birthday) I got into a deep depression. During that depression I lost my optimism completely. It was like something shifted inside of me. In the weeks before I became depressed, it had been brewing for a while inside of me but I ignored it. Then suddenly one morning, I just couldn’t do it anymore. I could not see the goodness in my life or people. It lasted for at least a year and a half, and with therapy I found a way out. Since then I have had two more depressive periods. And the only thing that helps me during these dark days is optimism. Telling myself positive things. One thing that helped me greatly was telling myself that Jesus loves me. As soon as I woke up, I would remind myself of Jesus love. And throughout the day I would repeat it. Then slowly, little by little, my happiness would return. Negative thoughts enter the mind so easily. With me it probably started at school. Someone laughed at my because I did not wear the right clothes. Then someone rejected me. And more people followed. Instead of seeing people for what they really are, I would try to locate the problem within myself. I kept trying to fix myself until I felt worthless and unfixable. But when exactly this started? I cannot put the finger on it. Little by little negativity ate its way into my soul until it had eaten me from the inside out. And yet the answer was so easy. The only thing that ever helped me was to replace it with positivity. Even when I was twenty my psychologist would make me look at myself and research myself as long as it took for me to see that things weren’t that bad after all. I wasn’t that bad after all. When I was twenty-one, a good friend of mine secretly filmed me with her camera as a joke. When I saw it back, I thought, wow she is a really great girl. Only to realize that this great girl was actually me. After all the negativity, this moment shifted my heart back in its place. For the first time I started to like myself. Which was a huge step forward! And it has only improved ever since. Like I said, I still have depressive moments that can last several weeks, but I don’t take it out on myself anymore. I just keep repeating Jesus’s love for me. I keep reminding myself of what is beautiful about myself. I literally talk myself happy again. And if I can’t do it? God the Father, Jesus and the Holy Spirit remind me of it. A happy life starts with loving yourself. I know the bible asks us to be humble, but there is a great difference between humility and pulling yourself down. You can see the beauty within yourself, love yourself and be humble at the same time. Humility simply means that you don’t boast about yourself. Or in the language of the bible; Honor one another above yourself (Romans 12: 10). When I realized this, it was a great eye-opener! For as long as I lived, I literally thought that I had to hate myself to be humble. But slowly, as I grew older, God started to show me a new reality. He asked me to like myself. 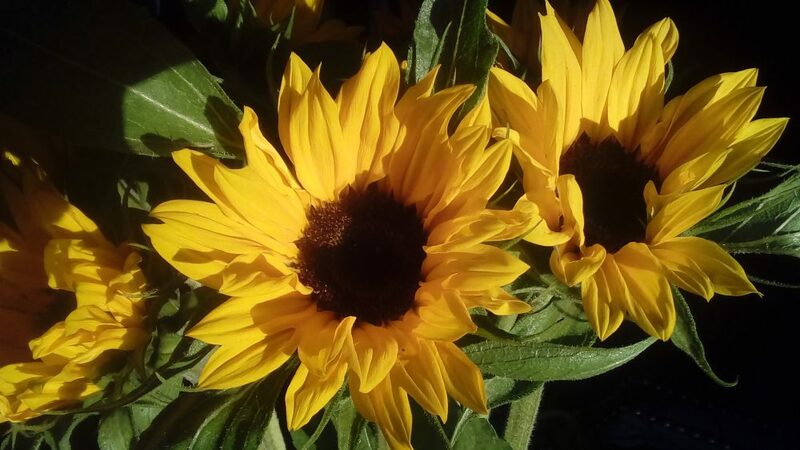 In the poem ‘The Sunflower’ (I posted it in a previous blog), God said to me, “I see the sunflower in you, now all I ask is for you to see it to”. God wants us to be positive and optimistic. He wants us to see His love for us and He wants that love to penetrate our soul so much that it covers our soul completely. But positivity goes beyond yourself. I can be very positive about myself but it is equally important to be positive about the world around me. To see the good in people instead of the bad. To give people a chance instead of rejecting them right away. To give someone a compliment or a kind word. Greet people on the street or smile at someone instead of living in your own world. If we try to be a little more positive, it can already change our souls and lives dramatically. Optimism is the key to a happy life. Not just for yourself but also for the people around you!